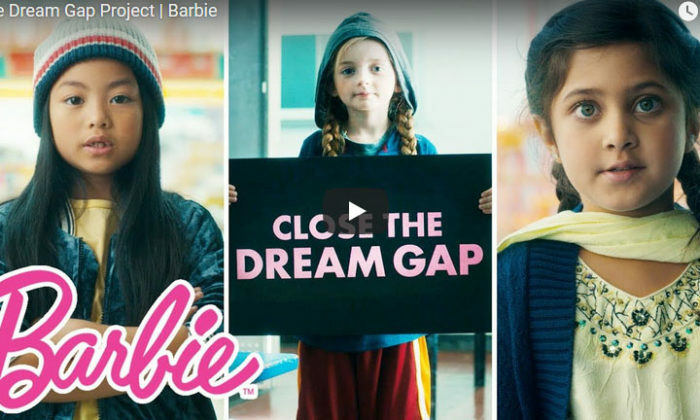 Barbie has created a new multi-year global campaign called Dream Gap Project to raise awareness around limiting factors that prevent girls from reaching their full potential. This comes after a study conducted by researchers at New York University, the University of Illinois and Princeton University found that from the age of five, many girls are less likely than boys, to view their own gender as smart and begin to lose confidence in their own competence. Cultural stereotypes, implicit biases and representation in media work together to further this issue. In the United States, this has been referenced as the “Dream Gap,” but there are similar trends seen around the world. Lisa McKnight, general manager and senior vice president, Barbie said the goal of The Dream Gap Project is to leverage Barbie’s global platforms to educate society on gender biases. “Since 1959, Barbie has inspired the limitless potential in every girl and we believe that empowering them at a young age is a catalyst to unlocking their full potential,” she said. To go about raising awareness, the brand will be focused on creating impactful content to provide adults with resources on how they can support the girls in their lives available on Barbie.com. Barbie also created a new digital spot, that builds on the “You Can Be Anything” campaign and explains the Dream Gap. It will also make a push on content by creating the Inspiring Women series to highlight underrepresented careers. Barbie is also encouraging imagination, expression and discovery. Through the campaign, the brand hopes to leverage Barbie as a role model and connect with girls through inspiring content that is centered on teachable moments. “By continuing to infuse purpose-driven themes in content, such as Barbie Vlogger, we are addressing issues that girls face in an unique and approachable way,” the statement read. It will also aim to show why girls more role models by highlighting at least 10 empowering female role models each year globally and rally with partners around the world with any like-minded companies who are dedicated to girls’ empowerment. Globally, Barbie will work with local researchers to extend these studies and find out more about girls around the world. The “Download Wealth” campaign has also been very successful in getting a top 10 position on the App Store within two weeks of la..